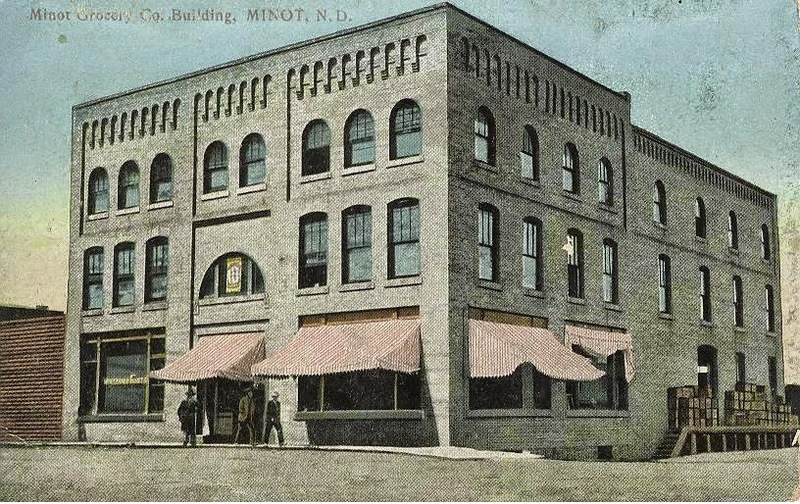 the Minot Grocery Company started operations in Minot in 1906. Its first home was in downtown Minot east of Main Street and north of Central Avenue. In the early days Minot Grocery was purchased by the Nash Finch Company. The Nash Brothers started business in 1885 in Grand Forks and were soon joined by Harry Finch. Nash Finch Company supplied products to the area Piggly Wiggly, Jack & Jill and Circle Food Stores. Nash Finch moved to a new, modern warehouse on Highway 2 & 52 West. They are still in business at the same location. That is now 16th Street SW and Burdick Expressway West. I have been curious about this building for a long time - nice to see it here! Do you know anything about its current state? I saw a building permit in the window from 2007 and a (pretty nice) fire escape half-installed in the rear. Seems like the project has been long since abandoned. It seems like people have been tinkering with it but maybe they did scrap whatever idea they had. Someday I'll buy this building and make it into something amazing... Like I already want to do with the Virginia and the plot next to it (with a tunnel entrance? :O ).